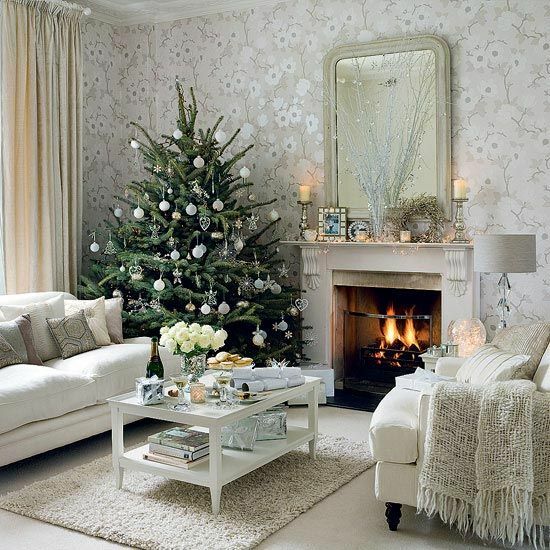 Christmas is always a magical time of unequaled joy and frenziness, especially when it comes to decorating our homes. Every year year we try to outdo ourselves in decorating trees, windows, homes and yards that would instantly bring oh’s and ah’s from our guests. Because front porches welcome guests and may be the first impression that visitors have of your home, celebrate the season with a splash of Christmas decor on your front porch to delight the senses and spread holiday cheer. Nothing says winter holidays like bright lights and no decoration is complete with them. They make the no. 1 choice in Christmas decorations whether you only choose to outline the front facing windows, to wrap porch posts or deck the entire porch with lights. Usually made from evergreens, wreaths symbolize strength, as evergreens last even throughout the harshest winters. So what better way to welcome your guests than some nice Christmas wreaths hung on your front porch door? Poinsettia plants are beautiful and in ample supply during the Christmas season whether real or faux. Natural poinsettia won’t survive a cold winter on a porch, but you may choose to display them at the front facing windows. Artificial flowers however will offer the same appearance with the ability to withstand the cold so choose artificial poinsettias to add to decorative flower pots and create a floral arrangement that will look great on your porch. A doormat may be seen as an insignificant detail in the overall Christmas decor but a welcome mat on your porch serves three purposes: visitors can wipe their feet and keep them clean before entering your home; a Christmas mat offers a touch of color; and preserves the consistency of the entire decoration. Choose a mat that is sturdy to stand up to traffic but is attractive and suitable in appearance. Wrap pine garland around pillars, posts and handrails. They have the advantage of looking very good with a variety of other decorations. You may wrap them together with lights or top them off with festive red bows. You can also drape garland on railing and from underneath the porch ceiling for a classic look. If you have a swing or some type of seat on your porch, look for a “porch sitter.” A stuffed reindeer, Santa Claus, snowman or some other type of porch sitter can add a bit of whimsy to your porch decor. You can always add a personal touch by including a written welcome message, be it on a chalkboard surface or such ready-made ornaments. Add fake snow, snowflakes or a stuffed snowman to your porch for a touch of whimsy. A snow shovel positioned on the porch adds a bit of fun and practicality. Go a step further by adding spray snow to the windows. Snowflakes are always pretty and may come in different shapes and even colours. They may be hung or taped to the door or windows. Santa Claus, his reindeers, Frosty the Snowman, the Grinch and many other such concepts make a great theme-based front porch design. Place a few different three-dimensional figures strategically on the porch to welcome guests and complete the look with coloured lights or special accents that match your chosen theme. Candles are an emblem of Christmas and are everywhere during this season so why not have them on your porch? Although there are some drawbacks in using them outside (they need protecting from the wind as they can easily be blown out and also require careful placing, out of the reach of children and pets), real candles have a lovely authentic feel which can hardly be replaced by electric Christmas candles. We definitely shouldn’t relegate Christmas trees to the living room space. A brightly lit outdoor tree, be it a cut tree that fits under your porch ceiling, or a live tree in a pot can invite added interest to a decorative front porch display. Decorate the tree with outdoor lights and ornaments and add wrapped faux presents under the tree for a complete display package.